The other day whilst stuck at one of those never ending traffic my husband casually pointed out a fellow traveller who was in bike with his entire family (wife + two kids). He observed how unsafe it is to travel like this on a two wheeler in such a traffic and although I did agree with him, a small part of me empathized and I couldn't help but feel a bit nostalgic. Growing up in a middle class family in a small town, comes with it's own share of adventure. My dad was in Indian Air Force and ever since I could remember we had our trusted scooter "Bajaj Chetak" with us. And what a sturdy vehicle it was! Even when we moved from one part of the country to another, our scooter would follow like a loyal family dog and within a week would be parked majestically outside our gate. Back then everyone around had a bajaj especially in Air Force campus and till I was 14, I didn't even know there were other brands of scooters! Those days it never struck us as unsafe to travel all aboard in a scooter, maybe because back then roads were never crowded or that there was no other option. There were hardly any cabs and bus routes were very specific and never accessible to every nook and corner. To maintain the balance everyone has to sit strategically, the youngest in family (which in our case was me) has to stand in front. Of course as I started growing tall I had to start squatting, for hours sometimes! Because having just a scooter never stopped us from taking a family picnics or trips often to far off places. 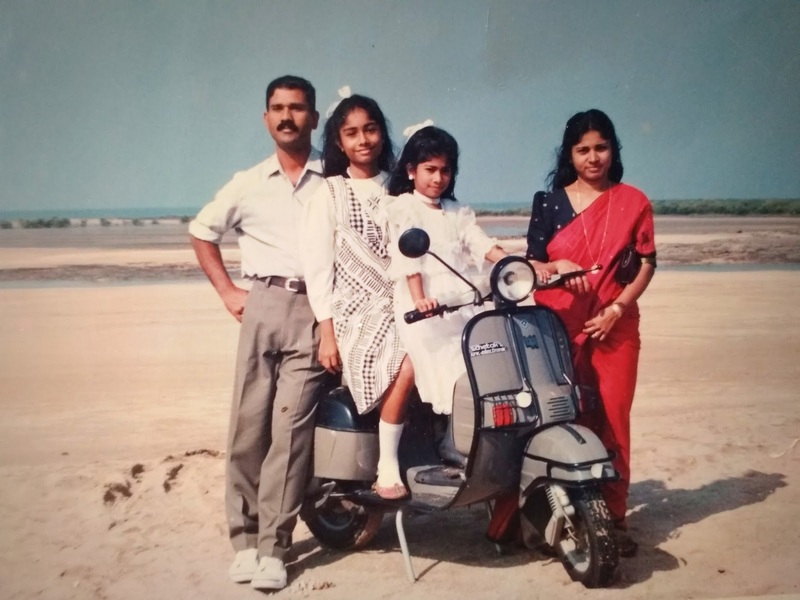 One of my most cherished memory is that of us going to Balachadi beach in Jamnagar around 30 km from our home. The place was spectacular and famous because during low tide the water recedes and all you can see is sand but as soon as the high tide comes in the evening the entire place is engulfed by sea. As if there never was a land and that the whole day you spent on those sands was just a dream. What a glorious day, all thanks to our scooter. Of course throughout the entire ride I had to squat or sit on knees sometimes but not for a single moment it felt uncomfortable or tedious. To this day my husband doesn't believe I could do that and rightly so considering now I can't squat for 2 minutes! But things were so different back then.. Among other such fond memories is the one from Assam where the mirror of our scooter was regularly used by monkeys to admire themselves! Huge clans of monkeys used to walk around the campus as if they ruled the land and the mirror fascinated them. At any point you would find 3-4 of them sitting on scooter and fighting to catch a glimpse in the mirror! But my absolute favourite memory is that of me waiting in our balcony awaiting my dad to come back from work in our Bajaj, he would always look out for me and I would wave at him, he wouldn't wave back or anything, in fact he would hardly smile (dad is a serious sort of fellow) but nevertheless he would always look up. It was our thing and I believe even though he never said it, he looked forward to it. Would it have been the same if he would have drove back in car? Maybe or maybe not.. I consider myself lucky that I never felt the sting of money even though we didn't have a lot, that my memories are not tarnished by lack of luxury but instead are filled with joyful and beautiful moments which will bring me happiness till my last breath. And I know for a fact that my childhood wouldn't have been the same without our Bajaj Chetak.